The male five-month old takahē chick at Zealandia has been named. The chick has been given the name Te Āwhiorangi which means ‘the encircler of heaven’. It references a sacred pounamu adze (cutting tool) that is said to be used by the atua (god) Tāne to cut the sinews that bound Ranginui (the sky father) and Papatūānuku (the earth mother). The name has been agreed by Zealandia, Taranaki Whānui te Upoko o te Ika and the Department of Conservation’s Takahē Recovery Programme. 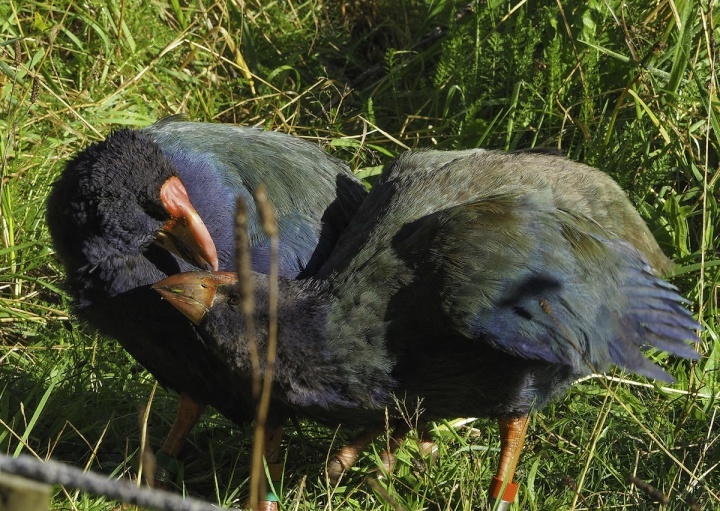 Te Āwhiorangi is shortly to be transferred to the Burwood Takahē Centre, Fiordland, to be fostered onto another pair of takahē as it continues to learn about how to thrive in the wild. Later in the year he will be released out at Te Puhi-a-Noa, more commonly known as the Murchison Mountains.Takahē Recovery make the decisions about where birds are transferred to as part of the national breeding programme.